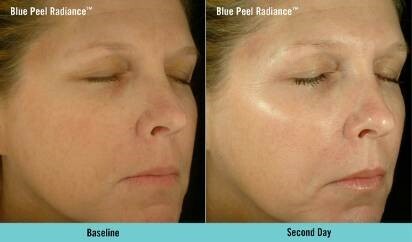 We are now pleased to offer Obagi Blue Peel Radiance. This treatment is a chemical peel which superficially exfoliates the skin to improve its look, texture and feel in a matter of minutes. The procedure is conducted one of our highly trained members of staff who will apply combinations of the solutions to the face, decolletage or hands. This can result in the improvement of a range of skin concerns, chemical peel also improve photodamage, pigmentation and skin texture making it look refreshed, renewed and radiant. To achieve the best results use 1 peel every 2-4 weeks, for a total of 4-6 peels. Call us today to arrange a free consultation about your Obagi Blue Peel Radiance treatment. Consultation and skin assessment included! What is Obagi Blue Peel Radiance chemical peel? The Obagi Blue Peel Radiance chemical peel is a non-invasive, chemical facial peel performed at our clinic. It contains a unique blend of acids to provide a gentle, yet effective, salicylic acid-based facial peel. The aims to result in tighter, smoother, brighter-looking skin with immediate results even after just one treatment. Treatments are performed at the clinic usually in a series of 6 treatments scheduled 2-4 weeks apart, approx. 2 times per year. 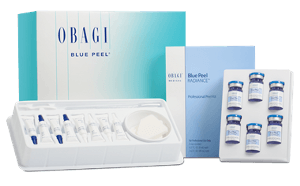 If the desired results aren’t achieved with a course of Blue Peel Radiance we may recommend a stronger peel such as the Obagi Blue Peel or the Obagi Nu-Derm kit. Treatments are carried out within our clinic by one of our qualified aestheticians. While this peel is formulated to be gentle, you may experience mild peeling and redness. The Radiance Peel is 2.7ph and 20% Salicylic acid with a blend of lactic and glycolic. Obagi Nu-Derm system – No if in initial 6 weeks of use. After this yes but stop the use of Exfoderm, Tretinoin/Blend 3 days prior to having your peel. Obagi C RX Stystem – Stop the exfoliating day lotion 3 days prior to the peel. CLENZIderm M.D. System – stop use of all products 3 days prior, normal protocol can resume 48 hours after if your skin can tolerate it. How can I prepare my skin prior to the peel? It is recommended that you continue to use sunscreen to help protect your skin and maintain the benefits of the peel even after the initial week. Too much sun exposure may cause improper healing and in some cases may reverse the benefits of the peel. Treat your skin gently. You may experience mild dry, red, or flaking skin for several days or more after your peel. Do not pick or exfoliate peeling skin. Do not wax or use any form of hair removal during the peeling stage. The dead skin will naturally slough off. This is for a few days after the peel. Instead, you can use Obagi Hydrating Moisturiser which is designed to not irritate your skin. You have active cold sores, herpes simplex or warts in the area to be treated. Wounded, sunburned or have excessively sensitive skin in the application area. Have Dermatitis or inflammatory rosacea within the peel area. Have used Accutane within the last 6-12 months. A history of radiation therapy in the application area.